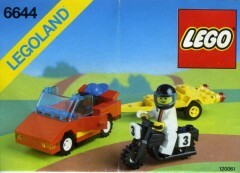 Today's random set is 6644 Road Rebel, released in 1990. It's one of 28 Town sets produced that year. It contains 68 pieces and 1 minifig, and its retail price was US$6. It's owned by 3423 Brickset members. If you want to add it to your collection you might find it for sale at BrickLink or eBay. That bike is actually pretty neat looking. Town set numero two. Let’s keep the streak up. Does Huwbot take requests? Back when cars were cars, and bikes were bikes. This is probably my favorite classic town car. So simple but beautiful, and so much fun and play capabilities. I specifically remember loving to build the trailer for some reason. I was visiting my parents who already had given me all my old Lego sets years before. I had gone through and built all the sets I could with the instructions I had. There were still many pieces left over and so I tried to hunt down which sets I had remaining. I could figure out some from my memory and some based on unique printed pieces but there were some gaps and some sets I knew I had but just didn’t remember. was super suprised to find these instructions! Anyway, I was visiting recently and found a box of odd things from my childhood - including the instructions to this set! Another set found! I haven’t built it yet (three kids with one on the way doesn’t leave too much time for Lego!) but I was just so happy to find another piece of my childhood. I guess riding a bike without a headlight IS pretty rebellious. I loved how every section of the set is in different color. I don't have the set but I MOCed a similar car. Lol, I just built Paradisa set 6416 Poolside Paradise and it comes with an almost identical car in black (with a little less pieces at the back). This is a really lovely Town set. Love looking at these. Look at that happy little guy, such a rebel! I fell in love with this car when I first saw it in the 1990 LEGO catalogue. I think this was the first set to ever have that 3x4 slope piece with mudguard, which made it impossible to replicate with pieces from my already large collection of LEGO. I had to have it, and thankfully not being a large set it was easy to buy with some saved up pocket money. Such a good little set. Good set for it's time, classic early 90s style. Sleek looking 4 stud wide sports cabrio car and trailer, and black bike with nice number tiles on it. My very first Lego Set. I loved to play with that so much! Most of all it connects to very exciting memories! My parents went with me and my brother through the shiny city and to an amazing shopping mall on their 1-day-only-trip (we were forced to return after that directly). They bought me this set with their very limited Begrüßungsgeld (German for "welcome money") a free 100 DM gift initiative from the Wester German government to welcome GDR citizens. And my brother got a set from outer space: the freaking 6830 aka Space-Patroller! It was like a eyeopening experience not comparable to anything else in the GDR as we didn't have any shopping malls and officially no real Western brands as they were seen coming from the capitalistic evil Enemy and therefore seen as forbidden. However, a small niche for buying Western goods was offered to GDR citizens. In so-called "Intershops" you may find some LEGO sets yet with inflated prices being 5x higher as you can only pay in Deutsch Mark and exchange rates from GDR to Deutschmark were very poor (5:1)! What a great set!! Loving memories with it!! I have even bought some parts of it in Bricklink to let my son play with the motorbike....but mine, although with playing marks, is exposed! !